May 21 was World Fish Migration Day, and spring operations for juvenile fish passage were in full swing across the Columbia River Basin. May is typically when more young fish are headed to the Pacific Ocean than adult fish on their way back to freshwater spawning areas. For this reason, and because downstream juvenile migration is the life-history stage where most human-caused salmonid mortality occurs, the focus this time of year is on juvenile fish. Before the days of hydroelectric dams, a spring runoff quickly swept juvenile salmon and steelhead from their natal streams to the ocean. These days, government agencies, utilities, Indian tribes and others are engaged--usually cooperatively--in facilitating fish navigation around dams and through reservoirs. Spring operationsfor juvenile fish passage began April 10 at Columbia River Basin dams and will be ongoing into the summer. Many measures to help migrating Endangered Species Act fish are laid out in the 2014 and other biological opinions and are federal salmon recovery caucus described by the federal salmon recovery caucus and their effectiveness evaluated by the Columbia River Inter-Tribal Fish Commission's 2014 Spirit of the Salmon Plan. Most of the measures that protect ESA fish likewise aid non-listed salmon and steelhead species. This year some new actions are being taken to help juvenile fish migrants, and several are reported here. On the Crooked River, a tributary of the Deschutes River in Oregon, the U.S. Bureau of Reclamation, U.S. Fish and Wildlife Service, NOAA Fisheries, Portland General Electric and others attempted to mimic historical spring runoff conditions by releasing a pulse of additional flow from Bowman Dam on May 16-18 to help steelhead smolts reach the Deschutes River and Lake Billy Chinook reservoir. At Ice Harbor Dam in southeastern Washington, BPA and the U.S. Army Corps of Engineers announced May 13 that workers had started installing new, fish-safer technology. The work includes structural modifications to the turbine draft tube exits to improve hydraulic conditions for migrating juveniles. The turbine design and installation represent collaboration between private contractor Voith Hydro, the Corps, BPA and NOAA Fisheries. In addition to helping juvenile fish, tests of the new fixed-blade runner indicate that power generation may increase by 3 to 4 percent. At Dworshak Dam, on the North Fork Clearwater River in Idaho, managers with the Corps have modified operations to accommodate a May 11 request from fish managers to increase flows to full powerhouse levels in order to help downstream migrating juvenile sockeye. The request was made at the weekly Columbia River Technical Management Team meeting (TMT), an in-season river operations coordinating forum. Flows were moved to the requested levels May 12-16. The Corps began refilling the Dworshak reservoir May 17, and will continue refill for the rest of the month. 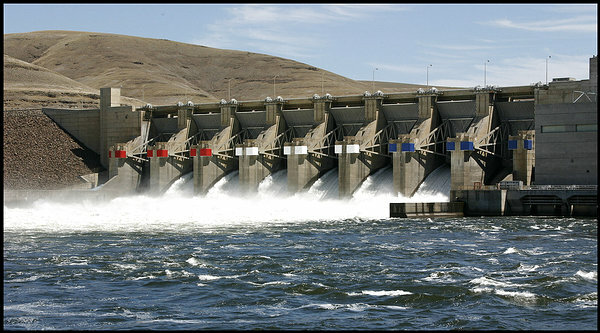 To improve juvenile fish passage conditions on the Snake River, the Corps delayed a transmission outage at the dam for a week, also at the request of fish managers. At Lower Monumental Dam, on the Snake River, fish managers asked during the May 11 TMT meeting that the spill pattern at the project be changed from bulk to uniform spill for two weeks or until PIT-tags show that most sockeye smolts have passed the dam. The adjustment to a uniform pattern will increase spill and spillway passage of juvenile fish, while decreasing the number of juveniles transported. "Lower Monumental is the best candidate for a spill pattern switch because it has the lowest relative benefits of transport of all the Lower Snake projects," said Paul Wagner, NOAA Fisheries' TMT representative. Given last year's mortality of adult Snake River sockeye, fish managers have put an emphasis on protecting this year's juvenile as well as adult sockeye population. The Corps implemented uniform spill May 13, and will continue that pattern through June 3 as requested by a majority of TMT members. Oregon and some tribal fish managers wanted uniform spill to continue for potentially an additional three weeks at the dam. In a related matter, upstream migrating adult sockeye will start returning to the Columbia River in June. There's concern among fish managers and dam operators that this year could be a repeat of 2015, when high flows early in the season were followed by low summer flows and warm water temperatures that combined to kill many migrating adult fish, including sockeye. Runoff has been early this year and temperatures at Bonneville Dam have already been above average. Sockeye, summer Chinook, steelhead and fall Chinook and are at risk again from low flows and warm water late in the season. Fish managers, including NOAA's Wagner, advocate early refill of Grand Coulee Dam as a hedge against a repeat of 2015. The Corps' Doug Baus, fish biologist with the Northwest Division, said his agency is monitoring water supply volumes on a weekly basis to see if Grand Coulee Dam might provide more flow in June to minimize the effects on sockeye that were observed in June 2015. However, he cautioned, the Corps must adhere to flood risk management elevation requirements.